Ashar Ahmad does not believe in heaven or hell. But he DOES believe in the soul. In fact, he has found a way to cheat dead, by inventing a containment suit, a "coffin" so to say, that traps the soul, and makes a person live on despite his/her body being dead. After proving that the suit works, Ahmad is killed by the Heller, the man who fund his work, so that he can keep the technology for himself. Ahmad managed to use the suit before his last breath, and he now lives on in the "coffin." But before his soul entered the containment-suit, he learns that his atheism is worth crap, since Hell is VERY much real, waiting for him. Realizing that he lived a wasted life, where he has been less than a man, he decides to make up for this in his second chance in the suit, and must get his technology back from the terrible Heller, as well as saving the daughter he disavowed until now. 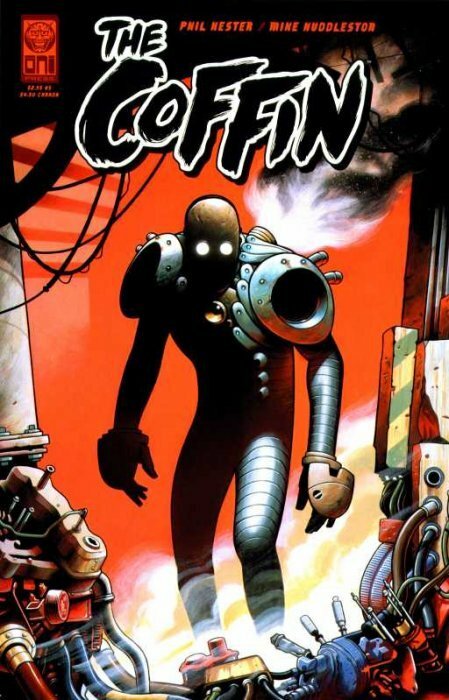 "The Coffin" is one scary sci-fi story. We see Ahmad who believes he has finally become the master of death, only to realize how small he really is. Heller is a disturbing villain, who are ready to to any lengths in order to stay alive, and he does it with a clean concision, believing that all he does is okay, since he is simply more important than whoever he steal organs from. Also, this series may have the most horrifying hell I have ever seen. Highly recommended. 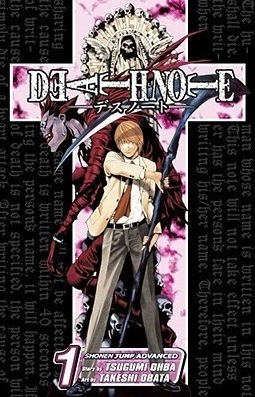 Light Yagami is a young man who pretty much success in all he does. And dear god, is he bored! Being 17 years old, and therefor still stuck in school, Light graves a challenge for someone as gifted as him. And then he finds the "Death Note". The little black notebook allow him to end a persons life, as long as he knows the name and face of whoever he wish to kill. Light makes it his mission to clean the world for criminals, one by one, and thereby create a utopia where everyone knows that crime really do not pay. But there is a bump on the way toward utopia. A bum by the name L. He is the worlds greatest detective, and since no one knows his name nor seen his face, Light cannot kill him. Who is smart enough to expose the other, and thereby achieve victory? The least scary thing about this manga is the deadgod, that follows Light around. Light has a sick, but brilliant mind, and he is completely merciless for anyone who does not fit in his plan for utopia. You have to be patient reading "Dead Note," and deal with a lot of "I knew you knew" but once you get into it, you have one heck of a creepy crime-fiction/horror story.